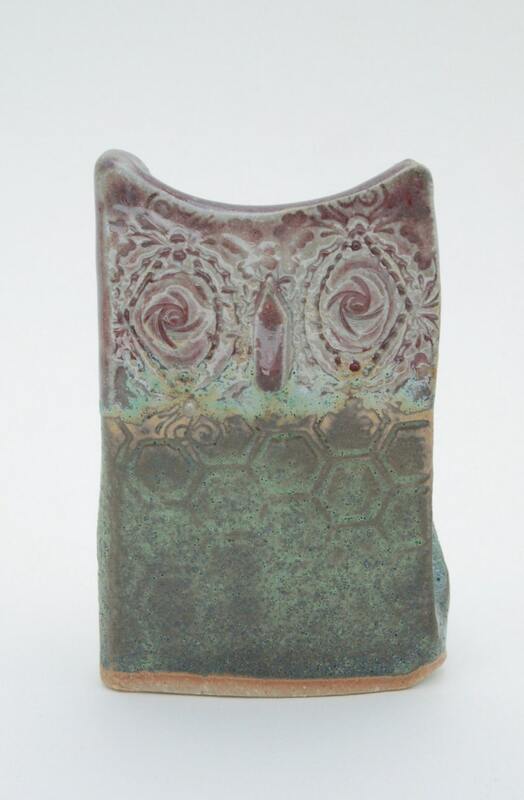 Flor is a small, free standing owl sculpture that was created by hand out of rolled, textured slabs of stoneware clay. Vintage buttons, old costume jewelry and both hardwood & rubber stamps were pressed into the clay. She was dipped in a high gloss cranberry colored glaze topside that breaks to a pale grey. Her bottom half is glazed in a matte finish that broke in places to a bright green copper patina. Flor measures close to 3.75 inches tall and 2.5 inches wide. She sits sturdily on a base of 1.5 inches deep.